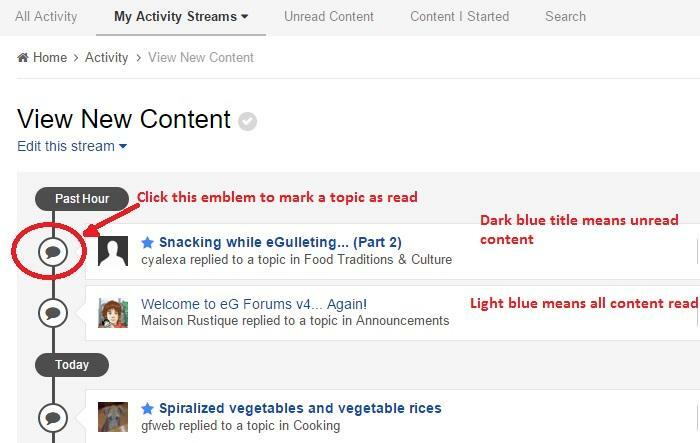 Topic and Forum listings are color-coded to help you identify topics or forums with content that you have not yet read. If you wish to mark something as 'read' without actually opening it, you have a few ways to do so. In this example, the top two forums ("Beverage & Libations" and "Cookbooks & References") have no unread content. The "Cooking" forum has unread content. To mark the content as 'read' without reading it, click on the icon circled in red. Near the upper right corner of a page is the label "Mark forum as read". Click it. In this case the topic listing is from the "View New Content" activity stream.